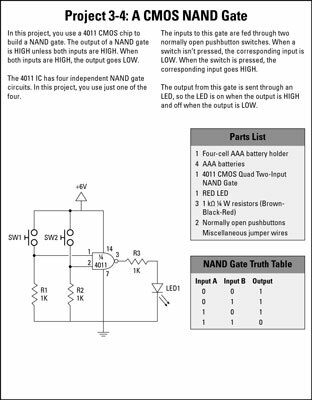 Electronic NAND gates (along with NOR gates) are universal gates, which means that you can construct any other type of gate by using nothing but NAND gates combined in various ways. The four electronics projects presented here walk you step by step through the process of building various types of gate circuits by using only NAND gates. 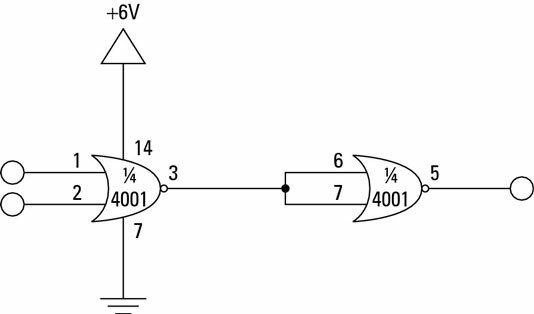 The 4011 Quad Two-Input NAND Gate is a popular CMOS logic gate integrated circuit (IC). As its name suggests, this IC contains four two-input NAND gates. A 4011 IC isn’t available at your local RadioShack. Thus, you’ll have to find a local electronics store that carries parts such as CMOS logic chips, or you’ll have to order them from an online source. The first project uses just one of the NAND gates in a 4011. 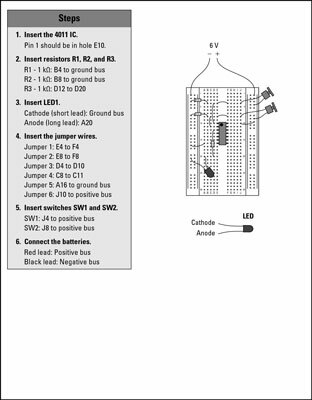 The two inputs of the NAND gate are connected to pushbuttons, and the output is connected to an LED. When you build this project, you’ll be able to visualize the operation of a NAND gate: The LED will be on unless you press both buttons. A NAND gate circuit that uses a CMOS logic chip. 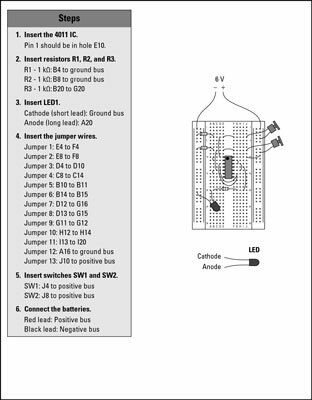 The next project uses two of the NAND gates on the 4011 to create an AND gate. Because a NAND gate is nothing more than an AND gate whose output is inverted, you can create an AND gate from a NAND gate by inverting the NAND gate’s output. This inversion works because of one of the fundamental rules of logic: If you invert a value twice, you get the original value. Thus, if you invert an AND gate once, you get a NAND gate; if you invert it again, you’re back to an AND gate. 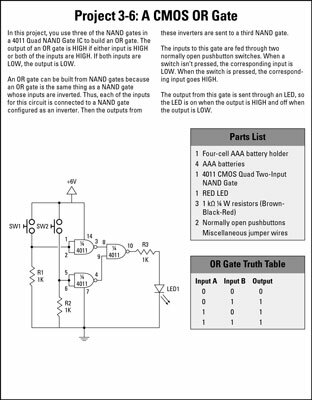 In the third set of project documents, you see how to create an OR gate by using three NAND gates. 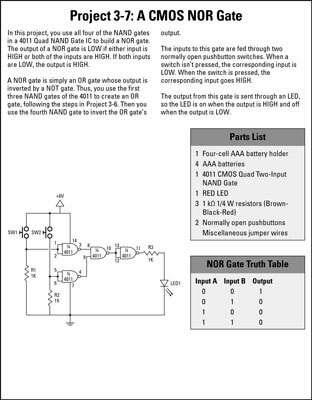 A NAND gate is the same as an OR gate whose inputs have been inverted. Thus, to create an OR gate by using NAND gates, you invert the two inputs with NAND gates configured as inverters (that is, with their inputs wired together). The output from these inverters is sent to the inputs of the third NAND gate. 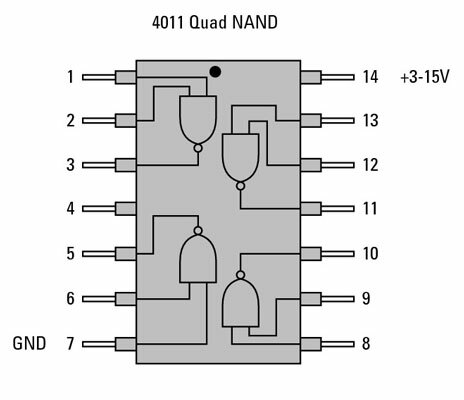 The final project uses all four of the NAND gates on the 4011 chip to create a NOR gate. A NOR gate is nothing more than an OR gate whose output has been inverted. 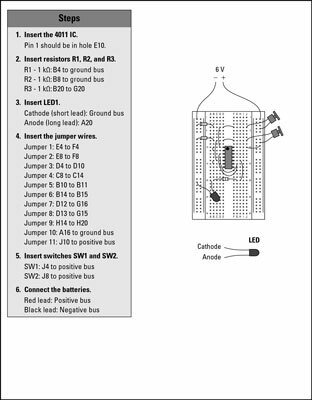 Thus, you first create an OR gate by using the technique in the previous project; then you configure the fourth NAND gate on the 4011 chip as an inverter to invert the output of the OR gate. Because these projects build on one another, don’t tear down your breadboard after completing each project. Instead, you can use each assembled project as a starting point for the next one. 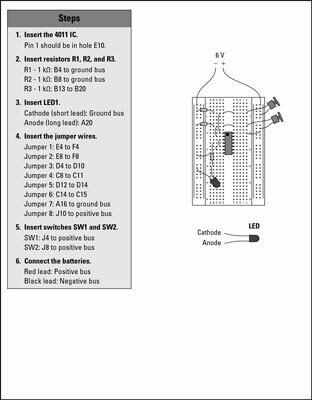 If you choose to build the projects in this way, you can just scan the steps to see what resistors and jumper wires need to be moved for each project. 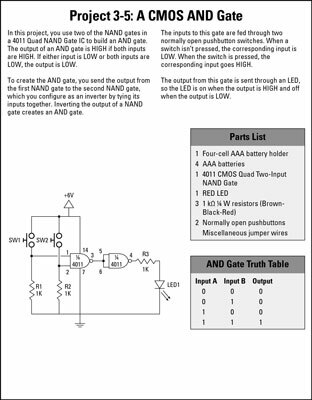 You can easily turn a NAND gate into a single-input inverter (that is, a NOT gate) by connecting the single input to both inputs of the NAND gate. This connection causes the two inputs to always be the same: Either both are HIGH, or both are LOW. In a NAND gate, if both inputs are HIGH, the output is LOW, and if both inputs are LOW, the output is HIGH. Thus, wiring the inputs of a NAND gate together has the effect of inverting the input.